Habitat encourages you to vote FOR for the 2016 Orange County Affordable Housing Bond Referendum. 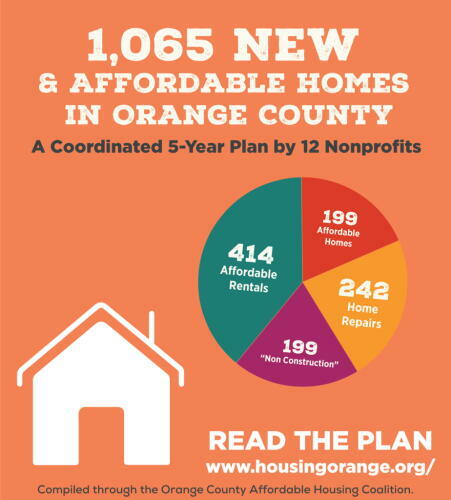 This Bond Referendum would provide $5 million dollars for affordable housing in Orange County, which could support 1,065 new and affordable homes for local families. In the past, bond funding has allowed Habitat to build neighborhoods such as Fairview and Phoenix Place. Habitat received $1,133,250 in bond funds for both neighborhoods, which created 73 homes in Orange County. The bond is associated with the $120 million dollar bond to help local schools. Habitat for Humanity of Orange County supports the school bond, as we believe that Good Homes + Great Schools = Great Community. Click here to see frequently asked questions about the bond in Orange County. Click here to learn more about why to support the bond.